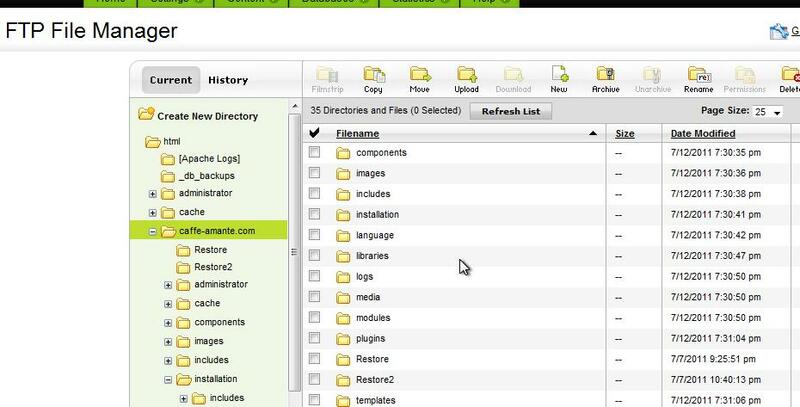 GoDaddy makes the Hotstart easy as I can simply go into my Hosting control panel, go into File Manager and upload the Hot_ecommerce_hotstart.zip and unarchive. I'm bypassing the FTP software in lieu of Godaddy as it's quite user friendly - but can you get an idea what's going on? the files are uploading to the Caffe-amante.com directory as you'll see in the attachment. Your guidance would be sincerely appreciated. First of all, make sure you uploaded and unpacked HotStart into the EMPTY directory. I used GoDaddy before and it was not possible to unpack such large archive directly on server completely. So, I used to unpack it on my computer and upload by FTP (Filezilla). Finally, I recommend you to use any cPanel based host, such as HostGator.com, to install and run Joomla's easily. ..so I should unzip first, then transfer. once I transfer the files, will the actual install occur thru filezilla? I dont see anywhere in the dashboard to actually "install". I thought simply uploading was all that was required. There is also a JavaFTP via godaddy that can be used for uploading - if I go that route, again, im confused with how to actually "install"
..am I missing something? thx! Filezilla is program for uploading files via FTP only. ..if i need your help for install, after I pay - what are ALL the details you'll need - specifically, in order to complete? I want to make sure I have everything written down somewhere. All we need to install template is your GoDaddy account username and password.